Crisp fillet of sea bream served with a Mediterranean olive oil mash, chargrilled courgettes and lemon gremolata. Pan-fried fillet of sea bream served with a creamy olive oil mash, char-grilled courgettes and a spicy black olive dressing. 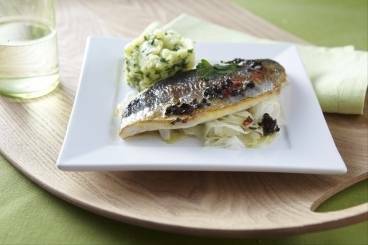 Crisp fillet of sea bream served with wilted fennel, crushed new potatoes and a spicy black olive salsa.